Yamanashi Prefecture (山梨県, Yamanashi-ken) is a prefecture in the Chūbu region of Japan on the island of Honshū. The capital is the city of Kōfu. During the Heian period, Kai Province was created in this area and it was re-named Yamanashi in the Meiji period. 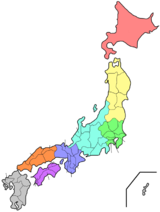 1871 – Kōfu was renamed Yamanashi Prefecture. The borders of Yamanashi Prefecture are formed by Tokyo Prefecture, Kanagawa Prefecture, Saitama Prefecture, Shizuoka Prefecture, and Nagano Prefecture. National Parks are established in about 27% of the total land area of the prefecture. Asama jinja is the chief Shinto shrine (ichinomiya) in the prefecture. Takeda jinja is related to "Takeda Shingen". ↑ 1.0 1.1 Nussbaum, Louis-Frédéric. (2005). "Yamanashi-ken" in Japan Encyclopedia, p. 1044; "Chūbu" at p. 126. ↑ Kofu City official website (English); retrieved 2011-11-29. ↑ 4.0 4.1 Nussbaum, "Kai" at p. 448. ↑ Japan Ministry of the Environment, "General overview of area figures for Natural Parks by prefecture"; retrieved 2012-8-28. ↑ "Nationwide List of Ichinomiya," p. 1; retrieved 2012-8-28. This page was last changed on 16 December 2013, at 20:25.